Chilling mackerel immediately on capture will help ensure a high-quality product. Mackerel species are sometimes responsible for ciguatera fish poison-ing and scombroid fish poisoning (histamine). 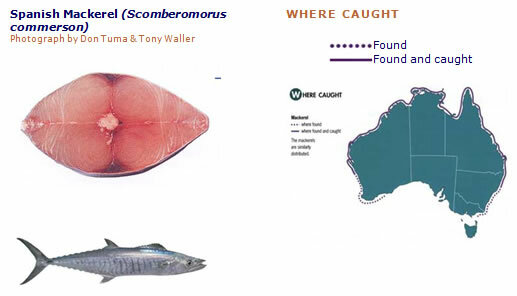 In Japan, the generic common name for members of the genus Scomberomorus is sawara while for members of the genus Scomber, saba is used. Grading standard grades exist but whole Spanish mackerel are sometimes graded as presented below. Among Australia s most popular commercial fishes (particularly in the north of the country), mackerels have a thin, edible skin with few scales making them very popular to enjoy when dining out or at home. Spanish mackerel, an especially good eating finfish, produces an attractive plate-size cutlet or an essentially boneless fillet. Mackerel can be fried, baked, poached, grilled, marinated, smoked and barbecued it is considered by some to be the best barbecue fish in the South Pacific. One should always take particular care not to overcook mackerel, and if the mackerel is being fried it should first be lightly salted. Mackerel frames are excellent for fish stock. The high oiliness of these species often requires the addition of an acid to balance the richness. This is easily achieved by baking the mackerel with vinegar and vegetables that, in turn, will give the mackerel a slightly pickled taste and provide a balance of flavours. Mackerel is also perfectly suited to an aromatic herb crust, served with baked tomatoes and anchovy butter. Some mackerel is deep fried in fish and chip shops in northern Queensland. This cooking method is otherwise uncommon for mackerel. Smoked or marinated mackerel is enhanced by the effect of crisp, dry white wine to counterbalance its natural oiliness. If the mackerel is simply smoked, select a racy sauvignon blanc.